Pictured: Matias Nujoma, Stephanus Ngenokesho and Fabianus Lazarus who were sentenced to 18 months imprisonment. Daniel Nghilifa Stephanus (top middle picture) is still a fugitive from the law. MATIAS Nujoma, Stephanus Ngenokesho and Fabianus Lazarus will each spend the next one and a half years in prison after they were found guilty in the Swakopmund Magistrate’s Court on charges of escaping from lawful custody. The three condemned persons along with Daniel Nghilifa Stephanus escaped from the Swakopmund Police Station on the 11 February. 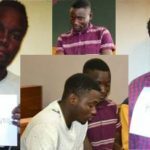 Nukoma, Ngenokesho and Lazarus were arrested in the area of Ondjiva in Southern Angola six days later and have since been repatriated to Swakopmund where they were swiftly sentenced to 18 months imprisonment on charges related to escaping from lawful custody. The Namibian Police are still searching for Daniel Nghilifa Stephanus. He along with Fabianus Lazarus and Jerobiam Simon Shidute are accused, of strangling and bludgeoning the 78-year-old Roswietha Strzelecki to death in her home during August 2017. The old woman’s husband, Siegfried Strzelecki who was 82 at the time of the brutal attack, died in hospital a week later the due to serious injuries he sustained. Shidute did not escape from lawful custody in February. At the time of their escape Nujoma and Ngenokesho were also awaiting trial on a charge of murder each. They stand accused of stabbing another man to death at a club in the Kuisebmond neighbourhood of Walvis Bay during 2016. The trio all pleaded guilty on the charges of escaping from lawful custody when appeared before Magistrate Nelao Brownin the Swakopmund Magistrate’s Court earlier this week. They were subsequently sentenced to spend the next year and half in the Swakopmund Prison where they will await trial on the original charges of murder each of them still face.